Alberto Macedo is a world-class pianist who got discovered as the resident pianist at the Four Seasons Hotel in Mexico City, where he entertained the likes of Madonna and Luciano Pavarotti at private parties, and has gone on to perform widely in Latin America and Europe. Pablo Buniak, a recipient of Argentina’s prestigious Estella de Mar award, is an internationally known vocalist. Together, they perform the great romantic popular songs of Mexico (boleros) and Argentina (tangos). 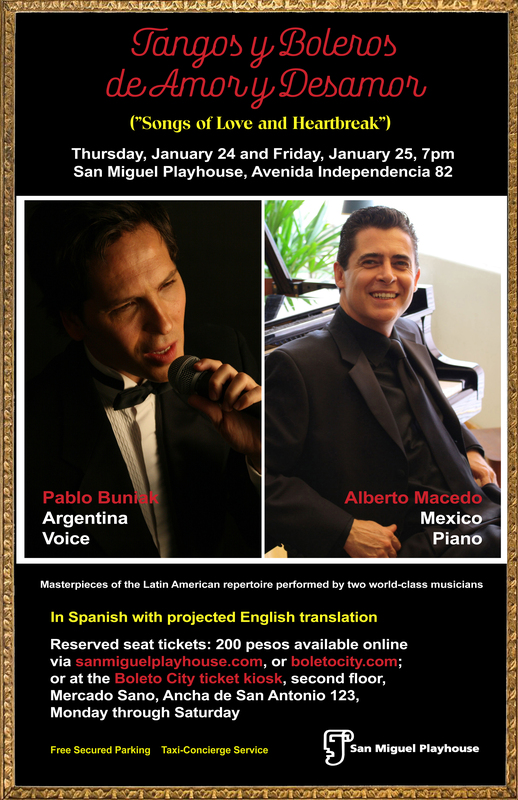 In their debut appearance at the San Miguel Playhouse, their show will be presented for the first time with supertitles, providing a simultaneous English translation of the songs they perform – the perfect introduction to persons unacquainted with the enchanting repertoire of Spanish-language popular songs. For those who already know the repertoire, it will be a chance to hear two outstanding artists performing songs such as “El día que me quieras” (Carlos Gardel), “Contigo en la distancia” (Lucho Gatica), “El último café” (Julio Sosa), and “Esperaré” (Armando Manzanero), among others. Click on the above “Buy Tickets Online” link to purchase advance-sale tickets for for $11 US each, plus an online purchase fee of $1.50. Note: If you purchase online tickets using a desktop or laptop computer, you may select specific seats. If you purchase using a mobile device, such as a smartphone, you will be given the best available tickets for the section you choose. Web sales for each performance end two hours prior to that day’s performance. There will likely be additional tickets for sale at the door starting one hour before each show.